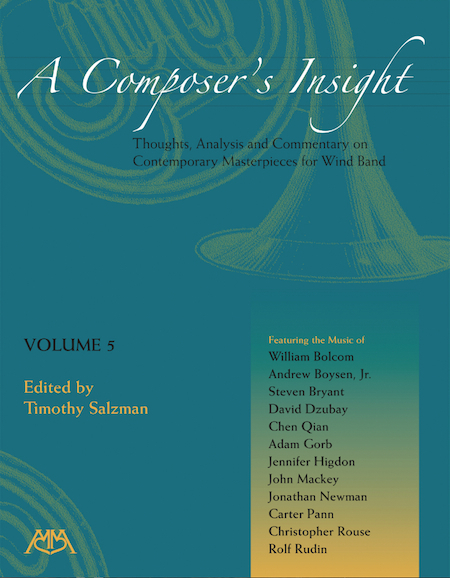 This text is the fifth in a five-volume series on major contemporary composers and their works for wind band. Included in this volume are rare, 'behind-the-notes' perspectives acquired from personal interviews with composers William Bolcom, Andrew Boysen, Jr., Steven Bryant, David Dzubay, Chen Qian, Adam Gorb, Jennifer Higdon, John Mackey, Jonathan Newman, Carter Pann, Christopher Rouse, and Rolf Rudin. An excellent resource for conductor, composer or enthusiast interested in acquiring a richer musical understanding of the composers' training, compositional approach, musical influences, and interpretative ideas.